Dr. Fallin is a graduate of the West Virginia University School of Medicine and a member of the Palmetto Health EM class of 2017. 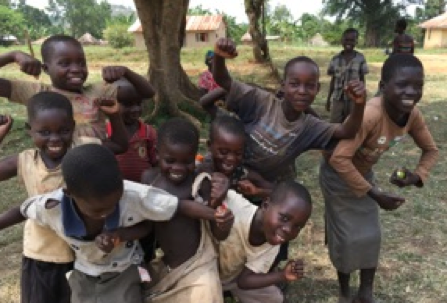 In March of 2016 I had the opportunity, along with Dr. Brown and the great folks from One World Health, to travel an extraordinarily long distance to experience the people and culture of Uganda. The trip had a rather disjointed start due to Delta forgetting that they needed a computer to fly their airplane. Luckily they were kind enough to put us up in a wonderful Atlanta motel with complementary breakfast! After this minor hiccup, we embarked upon our journey across the Atlantic, then the majority of Europe and Africa, before landing in Entebbe, Uganda. Entebbe is around 20 miles Southwest of Kampala, the capital city of Uganda, but in reality there is very little demarcation between the two towns. Its located along the beautiful Lake Victoria, the largest lake in Africa, which is bordered by Uganda, Kenya, and Tanzania. The city is extremely energetic with surprising signs of modernization but a prevailing element of a third world culture that is still trying to find its identity. Our travels are not yet finished. After landing, we are met at the airport by a representative of One World Health who chauffeurs us to our hotel for the evening. Our first night is spent coming to terms with how air conditioning is a privilege not experienced by the majority of the planet. After several cold showers, and a wonderful breakfast, we loaded unto one of the mission vans for the rest of our journey. After driving 5 hours north, up through the heart of the country, we made it to our home destination of Masindi. 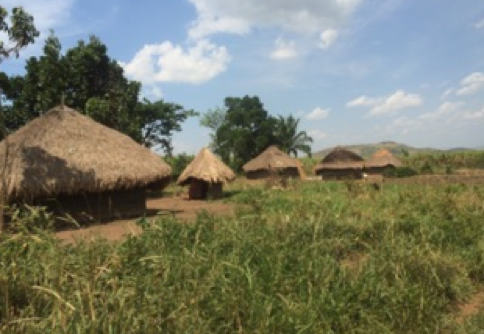 This is a smaller town where One World Health has established a permanent clinic. The design of OWH is a self-sustaining health care model that will be able to staff and train its own workers and be more efficiently run than the local government run facilities. They do require cash payments, but at unbelievably cheap rates and they are able to work with patients that are absolutely not able to afford their services. They have actually been able to expand to several other clinics in nearby villages and the goal will be for these to all be financially viable within the near future so as to not rely on permanent donations. They have x-ray, a new ultrasound, primary care, OB-Gyn services, in addition to general surgical procedures performed by the local physician. They have rooms and lodging for overnight as well as long term care. One World Health has an excellent relationship with a great local inn that is quite an anomaly for the region. Masindi itself is not a tourist destination, but several hours north of the town is the famed Murchison Falls National Park, and the inn has been a convenient pit stop on tourist groups traveling north. More recently its become the brief home of many mission groups to the area including OWH sponsored trips, U.N., and Doctors Without Borders. They provided excellent local dishes (i.e. carbs) and wonderfully cold showers at the end of long days in the heat. During our days while staying in Masindi we would travel to local villages by vans every morning to provide health screenings and medicines to villagers where they lived. They would wait for hours, marinating in the hot sun without food or much water, just for a chance to be seen. They had many of the same health complaints we deal with on a regular basis in the United States including heart burn, and osteoarthritis. The main difference, however, was the numerous parasitic diseases that we do not have the privilege of suffering. Malaria, ringworm, filarial disease, etc. I was impressed by the amount of influence the mission had already had in the area as many were already on prescription medicines, received vaccinations, or been diagnosed with some ailment. Unfortunately, but as expected, much of the morbidity that is present in the area is due to the poverty, lack of access to clean water, and general lack of knowledge of personal health and hygiene. Many of the patients lives were greatly improved just by being able to give them sunglasses to help with long term degeneration of their eyes due to a life spent toiling under the sun. While most of the days were spent in patient care, we did take time to enjoy the stereotypical mission trip activities of taking pictures with adorable local children, comparing music and lifestyles with particularly fluent translators, and struggling to learn bits and pieces of the local dialects. Each day we would climb reluctantly back on the vans, slightly more enlightened, but much more grungy , odorous, and exhausted for the trip home. Luckily, several in our group were blessed with unending enthusiasm and energy, and despite the somewhat cramped conditions, were still able to make glib conversation during the commute, otherwise it would have been silent pondering of what we had just experienced. Each night I would peel out of scrubs caked in a strong concoction of clay dust and sweat, clamber into the shower and turn on the wonderfully chilly water that erased my grimy farmer's tan. Afterward we would have dinner as a group and then a moment of reflection and prayer prior to heading to our beds. 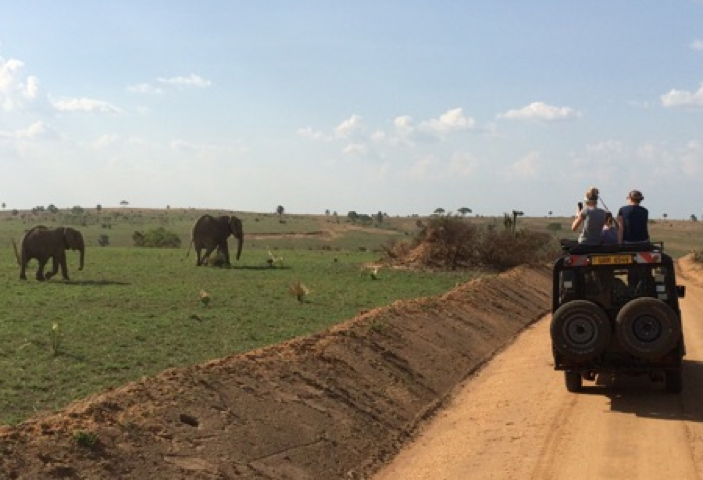 The last two days of the trip are spent on an excursion to the Murchison Falls National Park for a taste of what this area of Africa looked like prior to modern human influence. We get to spend the night at a resort in the park that really and truly has a pool. It was the greatest thing I had ever seen at that point in my life. We all impatiently waited for niceties to be exchanged between the resort staff and our group leaders before rushing off to don swimwear and plunge into the pool. After spending a relaxing afternoon floating, we prepared for our activities the next day which would include a true African Safari into the game reserve of the park. 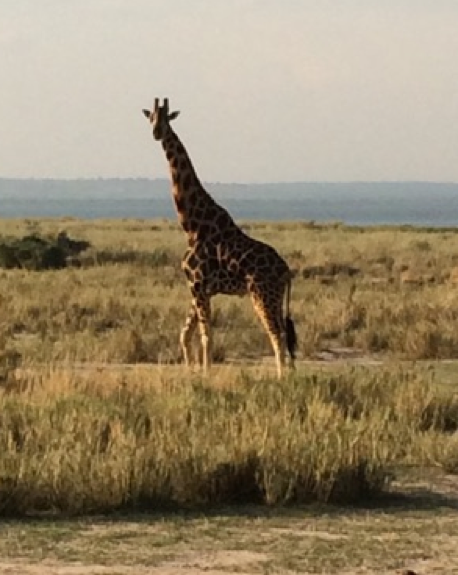 The safari was exactly what you expect, and well worth the expense. We got to see the entire cast of the Lion King (except of course the lions which decided to lay low) in their actual element. My only regret was not bringing a better camera, as my phone camera could just not due the scenery justice. After playing British explorers in the game lands, we traveled back to Masindi, before heading back to Entebbe for our red eye flight to Europe. Although I know it sounds very cliché, the trip was truly over way too soon. Friendships are best forged in such environments and the sheer number ofmemories that develop from these types of trips makes one wonder why more of us don't go on them. It may be much easier, cheaper, and safer to avoid such undertakings, but by doing so we will miss out on experiences that truly sculpt our worldview and life stories. The burden that the mission has undertaken is humbling in scale when you consider the number of villages still unreached in this one region, of one country, of one continent. Money donated to the mission, unlike many other organizations, is not just going into a bottomless pit of donations. The self-sustaining model that they have developed will likely be reproducible in many other underserved areas. This enables the reach of the mission to expand while still receiving the same financial backing. The trip itself is a great opportunity to experience and be a part of it, as well as a culture that is so foreign from our own.